Hello audio lovers, this time we will try to make the audio device that we have become stronger in bass tone and also more smooth in treble tone just by modifying the passive circuit only (the circuits that do not require a power supply). Actually, this way is old and very popular way. The way is to modify the existing potentiometer, and then we replace it with a "CT potentiometer"
Potentiometer with additional tap in the middle, CT = Center Tap. 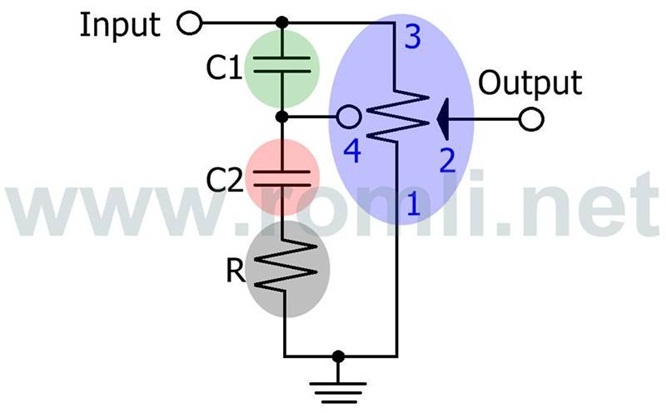 If you have used it, you can change the value of existing passive components (capacitors and resistors) in the hope that the sound produced in accordance with the experiment this time. 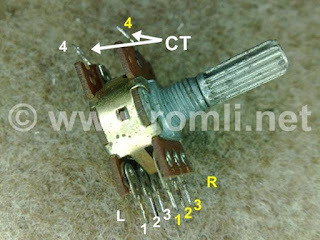 And did not rule out as well if your device or assembly does not use a CT potentiometer, this time you can try it. The downside of this CT Potentiometer is that it only works under half of the volume rotation, as the name suggests 'Center Tap'. 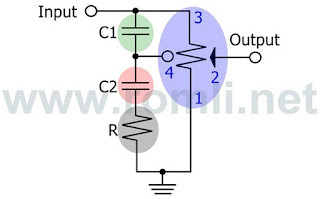 But we can outsmart by changing the value of the potentiometer or variable resistor with lower value. For example, before is 100k then we can replace with 50k. So, when we turn the volume (at a 50k potentiometer) at position 2 it is equivalent to turning the volume at position 4 in the 100k potentiometer. But.. rarely also we listen to music with a volume exceeding half of the round, quarter of the available volume round.. is satisfied, right? If you want a vocal impressed open, then just remove the C2 and R components. Will be impressed loud because the middle voice (vocals) participates prominently. If the treble tone seems less loud you can change the C1 with a higher value, or if the bass tone was less powerful you can change the combination of values C2 and R.
So it's a practical way to make the bass more steady and treble more smooth with no added circuit..